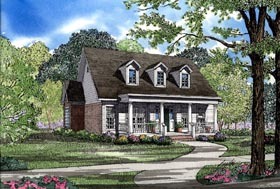 With the garage in the rear of the design, your full attention goes to the front of the home. The entry leads directly into the great-room, creating an instant welcome for family and friends. The laundry is conveniently located between the secondary bedrooms where most of the dirty laundry is generated. The L-shape kitchen with island/eating bar offers plenty of preparation space, while its open entry into the dining area is designed for convenient serving. A gas fireplace and built-ins create a cozy atmosphere in which family can gather. A kid’s nook keeps the children close-at-hand, even when Mom and Dad want to retreat into their quarters. The bonus room adds 790 square feet, offering all sorts of possibilities. This home is designed with slab and crawlspace foundation options.